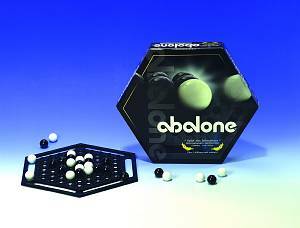 Abalone is a thinking board game, sold up to 4 millions pieces in 30 countries. He (sic) was granted to the rank of the "Game of decade" at the "festival international des jeux" in 1998. Easy to understand, Abalone is universal with a simple goal: push 6 from 14 balls of the opponent from board according to numerci(sic) superiority principle. Do you know many games where anyone between 7 and 70 years old can learn the rules in less than a minute, but a lifetime of playing isn't quite enough to master all of its many aspects? Abalone is one of those brilliant inventions that owe their existence to a stroke of genius. Simple? Certainly. Simplistic? By no means. For we all know that the possibilities of displacing balls, mounting attacks, organizing defenses and combinations are endless and they are invariably strategic. This is a very nice abstract strategy game and Mensa Select winner in which each player attempts to push the opposing player's marbles out of the borders of the board. Marbles move according to a simple set of can-push/can't-push rules, and the hexagonal shape of the board calls for cunning to eliminate pieces without avoidance or exposure. I recommend trying alternative starting positions, such as the Belgian or German daises. Highly recommended! This is a very tactile abstract game. Rolling clusters of balls around the board just feels great, and the game is both accessable and has depth. Abalone is a beutiful abstract strategy game. It feels great to push the marbles in the game around and the premise of pushing your opponents pieces off the board is a refreshing touch. Abalone provides a very deep gaming experience and it is certainly a game that takes years of practice to master. None the less, the rules are extremely simple and the pieces just feel inviting to play with.